Creating an authentic looking heating appliance that is efficient and easy to use can be difficult, but this gas coal basket from Hargrove puts of 20,000 BTUs but can be fueled by either natural or propane gas. 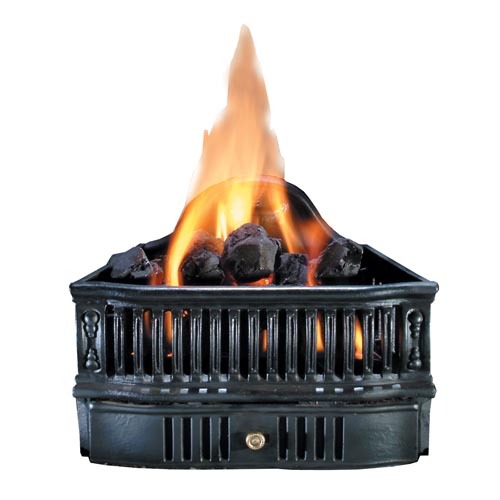 Each set comes with 9 realistic looking coals, and the decorative basket creates the look of an authentic coal basket. The 19 inch basket can be controlled wasily, and the small size allows this to fit in small spaces and eliminates the need to create a large area for this hearth accessory. Please Note: The fireplace's Middle Width must be at least 22 Inches and the Depth must be at least 10 Inches for this gas log set to fit. You can calculate the middle width of your firebox by measuring the width (left to right) approximately half way back in the firebox. If you have any questions, please contact our customer service department and we will be happy to assist you in finding the perfect size gas log set. Per the manufacturer, the approximate overall height of this unit is 14" at the center of the back arch. Do your Hargrove coal gas heaters have a quiet blower system? The coal baskets and gas log options on our site do not offer optional blowers as they are meant to be installed in traditional masonry fireplaces that would not have the ability to add a blower or prefabricated fireplaces that may or may not have an optional blower installed inside the chassis of the firebox. What is the overall "height" of this unit?